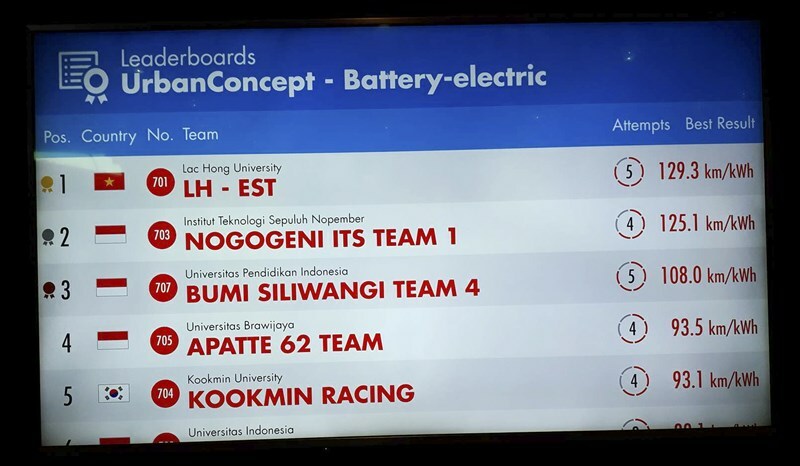 LHU's LH-EST team excellently won the championship at Urban Concept - Battery-electric category with a result of 129.3 kilometers per Kwh of electricity at Shell Eco-marathon Asia 2018 held in Singapore between March 8 and 11. LH-EST team from LHU excellently leads the race. LHU has won the championship titles for four successive years at 2015, 2016, 2017 and 2018 Shell Eco-marathon Asia. This is the fourth time LHU has won top prize at the fuel-efficiency vehicle competition of Shell Eco-marathon Asia. This is also the second time LHU team designed its vehicle run by electricity and won the victory before weighty rival as Indonesia teams. Shell Eco-marathon Asia 2018 attracted the participation of 100 teams coming from many countries across Asia. The competition took place from March 8 -11. Vietnam had 7 teams coming from 5 universities, competing at Prototype and Urban Concept categories with three fuels namely gasoline, ethanol and electric battery.